Utopia: a state of things in which everything is perfect. I think this blog outgrew "My Beauty Junction" a while ago. I wanted something that was my own; that stood for my own corner on the internet. For sometime now, I have been racking my head over names; a discussion with a few blogging friends yielded results. Huge thanks go out to Anne Smith of Betty's Beauty Bombs for suggesting Cosmetopia, combining Cosmetics and Utopia. Apart from producing the best dang nail art stamping I have ever seen in my life, Anne clearly has a penchant for copywriting. What is my version of utopia? It involves lots of great quality makeup, skincare that works, LOTS of gifts with purchase, subscription boxes that exceed their face value, haircare that removes frizz completely, acne treatment that eradicates pimples forever, makeup brands lowering their prices without compromising on quality... isn't this utopia a lot nicer than the one that politicians promise? For fellow-bloggers looking to change their domain name, here's a step-by-step look at how I rebranded, changed my domain name and redirected the old URL to the new one. My rebranding process involved two major activities - a redesign and a new name. Nothing else changed. While I had bought my first domain name, mybeautyjunction.com, in 2013, I used to follow the Simple Blogger template for a long time. Last November, I had moved to a new layout, designed by code wizard Linda of A Blog Fairy. I then bought my new domain name last week. 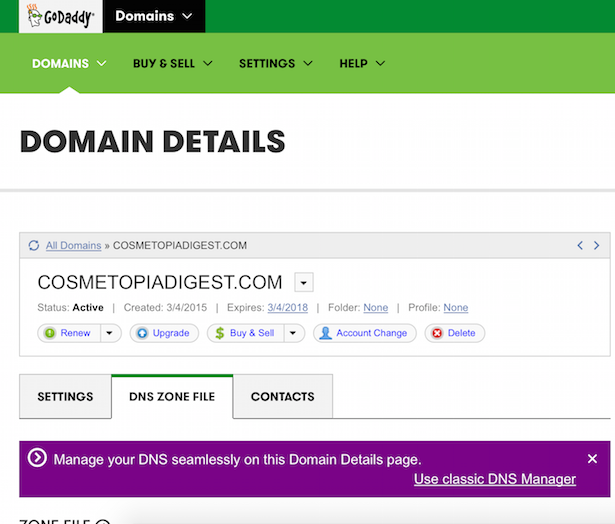 I used GoDaddy.com this time; I was on eNom.com before. And, this is how I connected the new domain name to the blog and kicked out the old domain name. 1. 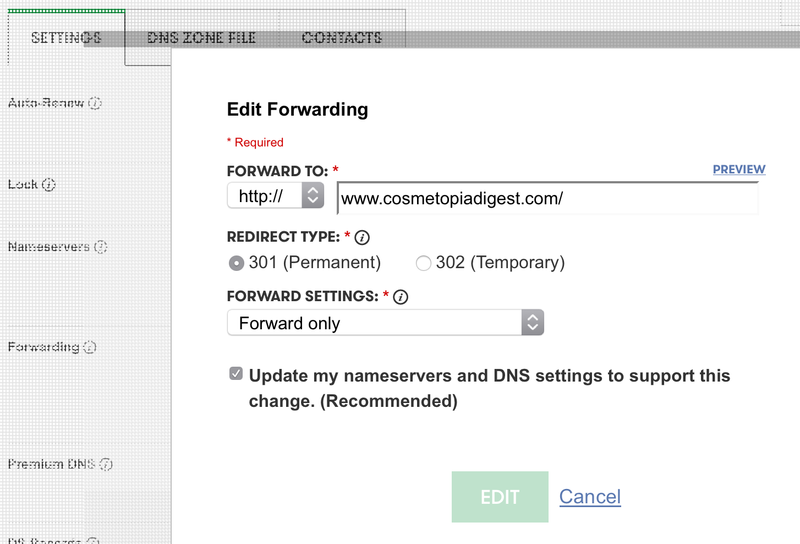 I went to eNom's access point here, logged in, copied the Host Record settings I had there (details below), and changed it to redirect mybeautyjunction.com to cosmetopiadigest.com. A random string of letters/digits under something marked CNAME. A code next to the random string of letters. For Blogger blogs, the code should end in .....googlehosted.com. For other blogs, it should end in whatever your host follows. So make sure you get the four A Address records and the CNAME random string of letters or digits and the code next to it. 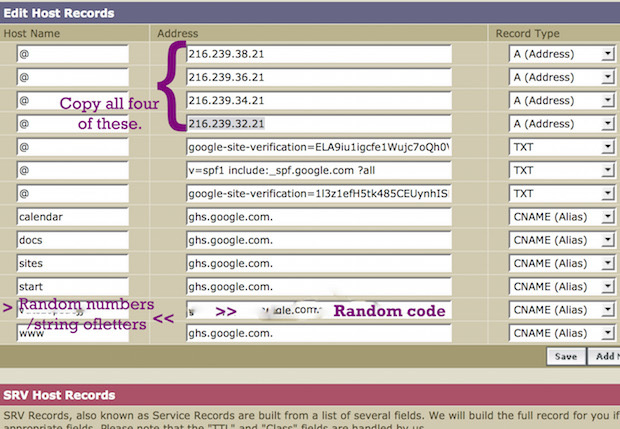 The A records point your domain name to the host IP address. The CNAME code, however, is specific to your blog. 4. 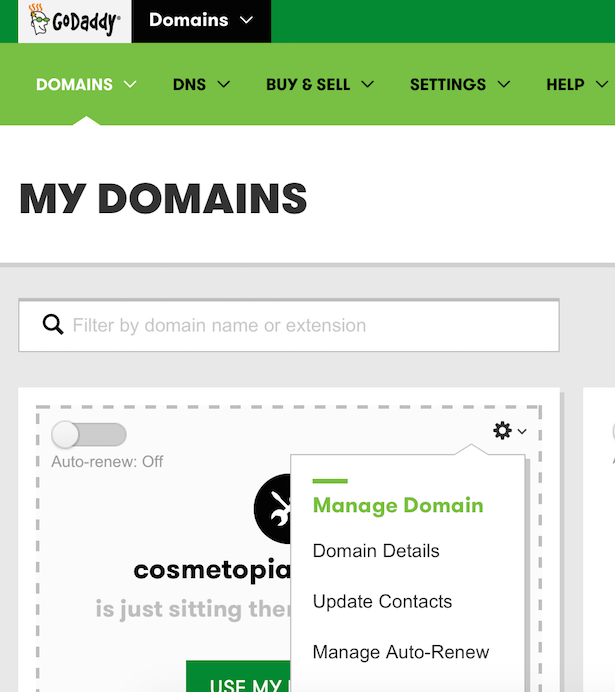 Now on GoDaddy, go to My domains > domain details on the dropdown menu on the gear. See photo below. 5. 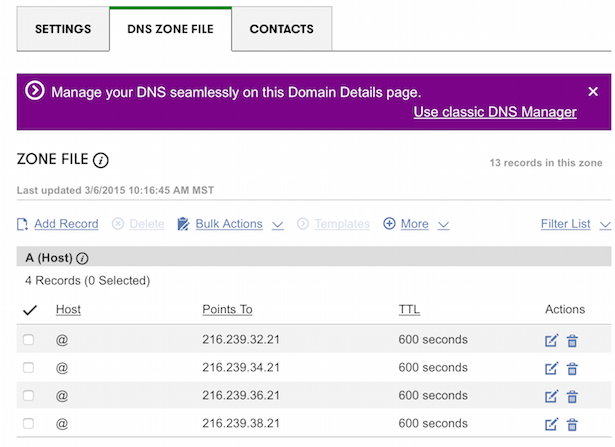 Under Domain Details, choose the DNS Zone File tab. 6. Now you have to enter the codes you saved from your previous domain name. 8. To edit, click the little pen-on-paper button before the Trash button. Make sure all TTL values are the same. That's the time taken before your edits go live. 10. Retain the email and ftp values that are already here under CNAME, and add two new records. 11. 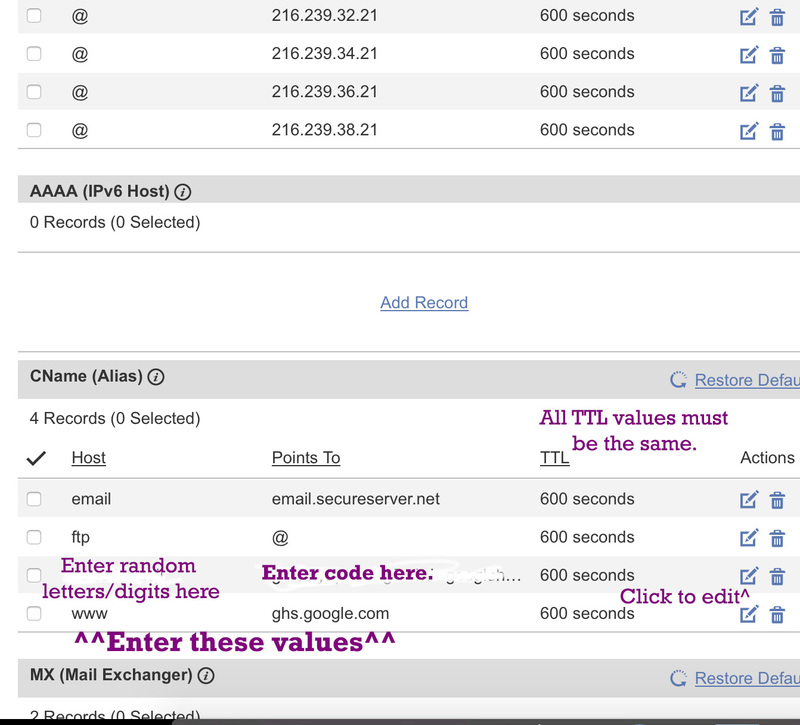 In one, add www under host and ghs.google.com under "Points to". 12. In the second new record, add the random string of letters/digits you copied from your previous domain name's settings under "Host". 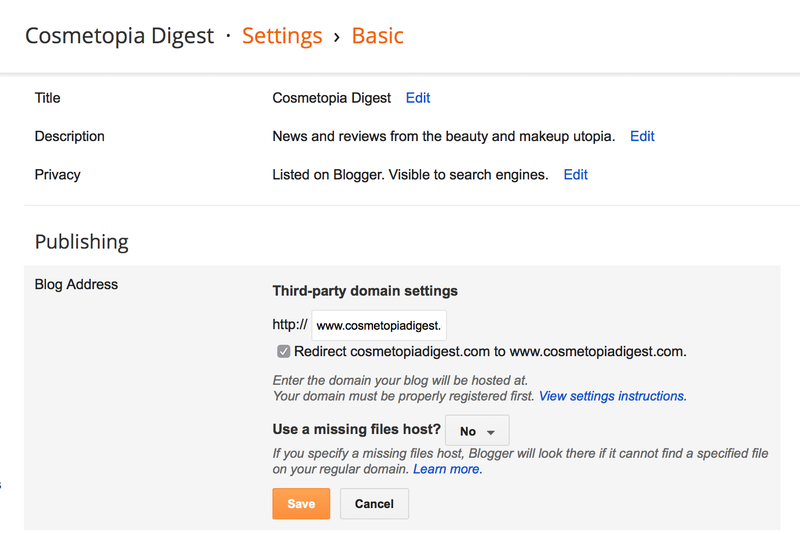 Under "Points to", add the specific code (the one that ends with the host details - googlehosted.com for Blogger blogs". DO NOT CHANGE ANYTHING ELSE. Not the MX or TXT or SRV or AAAA or anything else. 14. Go back to the Settings tab. 15. Make sure everything looks like this. 16. Now I know you might want to change "Forwarding" to move yourblog.com to www.yourblog.com BUT GoDaddy customer support told me exactly an hour ago - after my blog vanished for a while - not to change this but to redirect this from Webmaster Tools. 17. 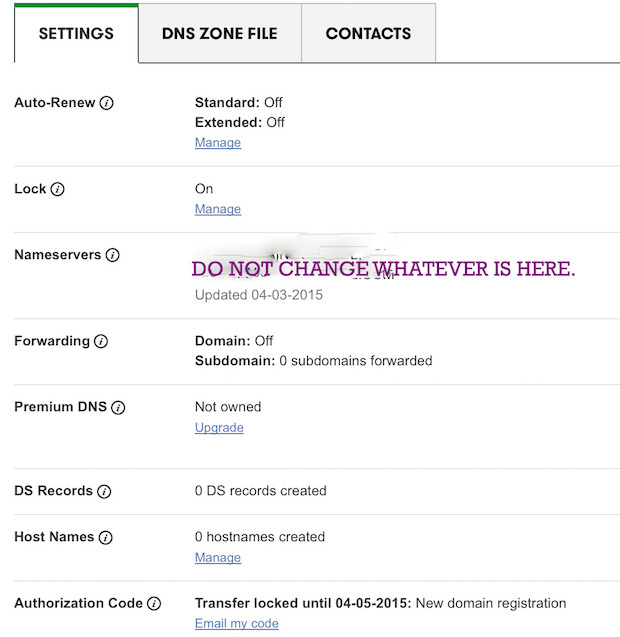 Now go to your old domain name dashboard - in my case, access.eNom.com. It could also be on GoDaddy itself. 19. Replace the thing in bold with your new domain name. Enter "www" under Host name and choose "URL Redirect" under Record Type. 23. Save. Your blog will not show up until the TTL has lapsed. I panicked and called GoDaddy, screeching like a banshee. The bloke who answered my call is taking tomorrow off to go see an ENT specialist. 24. All your previous posts will automatically redirect to the newdomainname/path without any problems, if you have followed this process to a T. Even Pinterest pins and links left on social media and other blogs do - I checked. 25. Make sure you hit Webmaster Tools, add your new site and submit a sitemap. Google will index the pages and update the search results shortly. Anyway, your old links will automatically go to the new blog! I hope that was not too complicated. Too verbose, yes, but since when do I know to be pithy? Incidentally, my new blog name is also a nod to my addiction to utopian and dystopian fiction. I've even written a dystopian novel of my own, back in 2012. It was named Chiefly and features a rebel trying to overthrow the existing suppressive regime and then goes on to create her own utopian society in the sequel, and it was so bad that I hope it remains unread by any soul forever. It will take some time for everyone - myself included - to get used to the new name, but I hope this change will soon be accepted by all of us. If you have bookmarked this website, please do bookmark this new one. Oh, and there are TWO giveaways coming up over the next couple of weeks, so do keep a lookout for those! What are your thoughts? Too late to do anything about it since I've already bought the domain name, but would love feedback nonetheless.